Since this is going to be a recap post of how my portfolio has fared during my blogging absence I figured it was only fitting to do a little flash back to the early 2000s with the appropriately titled "Since You've Been Gone" by Kelly Clarkson. I was a bit more partial to Ted Leo's cover of the song during my college years, but to each their own. Over the last few months I haven't been active in the blog world because life definitely gets busier with a 1 year old...and travel...and a new/old job...and hurricanes. However, my absence from writing didn't mean that my portfolio took a break. The whole time that I was gone my portfolio continued to go to work FOR me churning out dividends. There's nothing quite like not working, but still getting paid. I have to say that I'm pretty happy with how the portfolio did in my absence. From June through nearly all of September my FI Portfolio churned out over $2,200 of passive income and my Roth IRA earned another $100. That comes to a total of over $2,300 of passive income over the last 4 months between the 2 portfolios. I don't think anyone would complain about receiving $2,311.92 of income over the last 4 months without having to work for it. That's the equivalent of a minimum wage worker earning $7.25 / hr working almost 320 hours of that time frame. Yet I earned it while taking a road trip because I had saved and invested beforehand. Receiving dividends is just one part of the dividend growth investment strategy; the other integral part is the growth of those dividends. 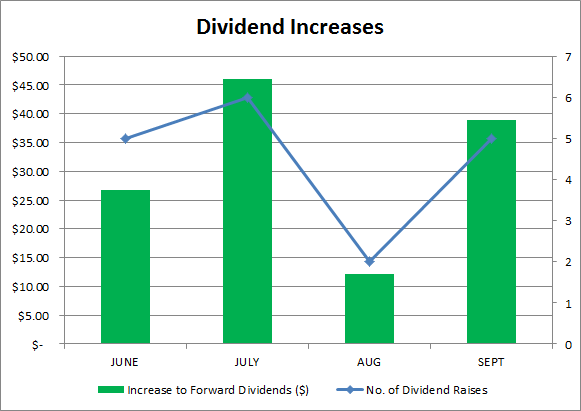 That's 18 dividend increases amounting to a total increase of nearly $124 for my forward dividends. All of that was for doing nothing at all. Back to the minimum wage worker that's like getting an extra 17 hours of work from them each year. While my preferred investment strategy is a truly passive one, that doesn't mean I don't want to take an active approach as well. You see over the time that I've been investing I've come to realize just how much principle we'll need invested in order to live solely off of dividends. Of course the best thing would be to reduce our expenses which we're working on. Since rolling over my 401k last year I've been experimenting with option trading as a secondary way to generate investment income. When you sell options, calls or puts, you receive option premium upfront which is similar to the premiums you pay for insurance coverage. The reason I'm doing this is because option trading can generate substantially more investment income than dividends alone. For comparison I generated over $4,600 of option profits with much less capital compared to the $2,300 of dividends over the same time period. Overall I'm pretty happy with the way the last few months have turned out. I generated over $2,300 of truly passive income in the form of dividends, got raises from 18 companies that I own amounting to an over $120 increase to my forward dividends and successfully used options to generate an additional $4,600 of income. The 4th quarter of 2017 (How in the world is that already here?!?!?!!!) is fast approaching and I can't wait to see how the year ends up. I've still got a bit more housekeeping to do before I can get back to a regular writing schedule, but I'm looking forward to making progress and following along with all of you. Unfortunately I won't be able to get back to regular investing in my FI Portfolio until sometime in 2018, but the beauty of dividend growth investing is that my forward dividends keep moving higher with each dividend increase and reinvestment. With the 3rd Quarter of 2017 nearly over are you on track to surpass your dividend goals? Are you planning to use other income sources than dividends to fund your early retirement such as option trading? $7K in extra income over that time period is fricken awesome. 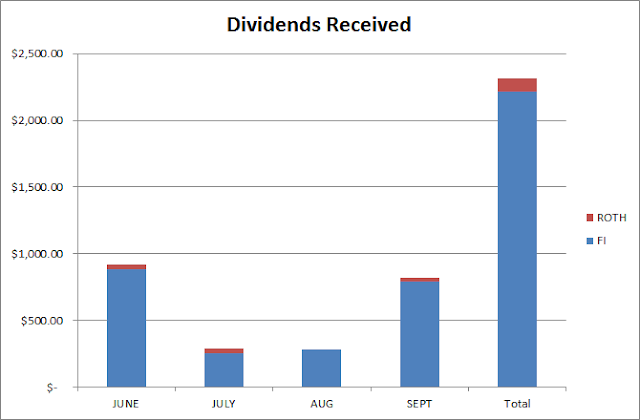 Love the dividend increases as well, the beauty of being a dividend investor, that's for sure. They are taking care of you, continuing the fuel to the engine, so you are never on "e". Nice work in your absence I would say. Welcome back. I just discovered your blog and like what I'm reading. You had a nice passive income while away! Keep up the good work. Options trading was crucial to my ability to FIRE on 5OCT2012. It is less important now that I have lots of CEF bonds funds kicking off substantial income. Thanks so much! That is helpful. 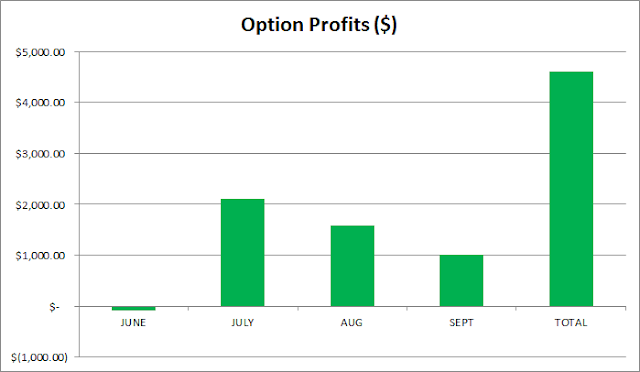 Options trading can be a great vehicle for monthly income trading. I'm currently trading a variety of broken wing butterflies on the SPX with the goal of $3k-$4k per month. I've been having a lot of success and the ultimate goal is to retire from the corporate/cubicle world soon and become a full-time trader.